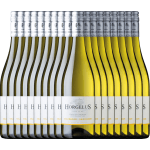 The 18 X Domaine Horgelus Blanc Côtes de Gascogne is a white wine made by Domaine Horgelus from Côtes de Gascogne that contains sauvignon blanc and colombard grapes. The 18 X Domaine Horgelus Blanc Côtes de Gascogne is the ideal white to combine with fruits and cheese. What are the opinions of other vintages or volumes of 18 X Domaine Horgelus Blanc Côtes de Gascogne?